Rabindranath Tagore, the first non-European laureate of the Nobel Prize in Literature in 1913, visited China 95 years ago. During the Indian poet's visit, he was mesmerized by the premiere of his one-act play-"Chitra"-starring Chinese poet Xu Zhimo and architect Lin Huiyin. Despite the profound implications of Buddhism, which was introduced to China from India several centuries ago, exchanges between the two neighboring countries had been minimal. However, Tagore's path-breaking visit revived China-India relations. The Indian poet was impressed by China's charismatic culture and in 1937 opened Cheena Bhavana at Visva-Bharati University in Santiniketan, West Bengal, India. 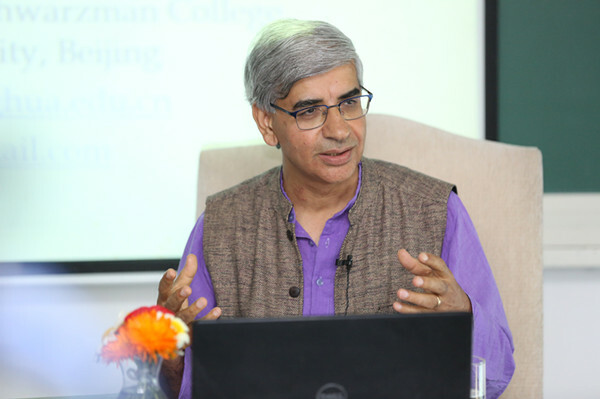 "This is the first modern institution in India dedicated to the study of Chinese language, philosophies, literature and history," said Daya Thussu, the Disney Chair in Global Media at Schwarzman College, Tsinghua University in Beijing, China. Having visited China several times since 2004, Daya Thussu, professor of International Communication and Co-Director of the India Media Center at the University of Westminster in London, expects China and India to form closer ties with increasingly frequent exchanges and deepened mutual understandings between people in the digital age. He recalled several years ago, when visiting Xi'an, the capital of China's northwestern Shaanxi province, he visited the Dayan Pagoda twice. Dayan Pagoda is a historic site first built to commemorate Buddhist Xuanzang's return from a pilgrimaging odyssey to India, where he brought back a considerable amount of Buddhist scriptures, sculptures, and paintings during the 7th Century. During Thussu's second visit, he was happy to meet some young Indians at the Pagoda. Xuanzang's lifetime endeavor was to translate Buddhist texts into Chinese. Thussu believes people should bow their heads in respect to the greatest scholar who initiated the civilized dialogue between the two major ancient civilizations in the world. "This is a huge connection between India and China. This is neither about war, nor conflicts. This is about ideas. It is an intellectual exchange. It is a civilizational exchange," Thussu added. The constellation of wisdom in the past is still glittering. As the two emerging countries in the developing world, China and India have made headways in response to the world's newest round of technological innovations. "When the internet was first introduced as a global phenomenon in the middle of the 1990s, more than 40 percent of people who were using the internet were Americans," Thussu said, "today that figure is less than 10 percent. Therefore, the majority who are using the internet now are Asians, with the largest number from China followed by the second largest number from India, because they have huge populations." Thussu is especially impressed by China's essential role in modern technologies, represented by globally recognized brands, including, Tik Tok, Alibaba, and Tencent. Moreover, he is deeply concerned with China's efforts to bring the 5th Generation Wireless System (5G) into reality. "5G is absolutely crucial," Thussu said, "because it is not just about phones. It is about the 'Internet of Things.' Internet of Things means more than what we have had in today's internet, and China is ahead of the curve." Despite being a professor in international communication, Thussu is cautious about computers' replacing manual jobs. This is exemplified by the adoption of automatized journalism as stories are being finished by tapping in several data and keywords. In addition to the Associated Press and many other news agencies, which adopted automatic news reporting system, Xinhua is also running a virtual reality studio, and CGTN has employed anchors who are not human beings. "Journalism is not about information or data. It is about feelings, sentiments, and emotions…humans are not machines. So if you use machines to analyze social realities, it can be a problem," Thussu said. When talking about the recent New Zealand massacre, the professor said he is concerned with the downside of people's obsession with social media, particularly those who use the virtual reality technologies, which may misguide people to be emotionless and apathetic. Therefore, he called it a process of de-humanization and warned that it would be dangerous if people looked at a massacre like a game. Despite all the negatives mentioned above, he is hopeful, with the advancement of society, that visualized media will facilitate cross-border communication. "There is a huge gap to be tapped…and the communication makes the world a better place," he said.